Aerospace Rocketdyne provided a mighty sendoff to the U.S. Air Force Space Command (AFSPC)-11 satellite aboard a United Launch Alliance Atlas V rocket from Cape Canaveral Air Force Station, Florida with just over 1.74 million pounds of added thrust from the Company's five AJ-60A solid rocket boosters. The mission is the eighth flight of the Atlas V 551 configuration, the most powerful Atlas V variant that has flown to date. The Atlas V 551 configuration features a 5-meter payload fairing, five AJ-60As and a Centaur upper stage powered by a single Aerojet Rocket RL10C-1 engine. This configuration of the U.S. government workhorse launch vehicle delivers 8,900 kilograms of payload to geostationary transfer orbit (GTO), and also has been used to send scientific probes to explore Jupiter and Pluto. The Centaur upper stage also uses smaller Aerojet Rocketdyne thrusters for pitch, yaw and roll control, while both stages of the Atlas V employ pressurization vessels built by Aerojet Rocketdyne's ARDÉ subsidiary. 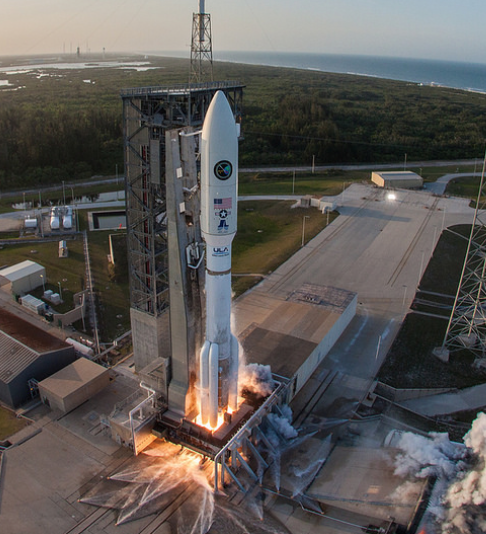 Aerojet Rocketdyne CEO and President Eileen Drake said that the Atlas V is able to perform a wide variety of missions for both government and commercial customers, and the AJ-60A is a major factor in that versatility. Aerojet Rocketdyne developed the AJ-60A specifically for the Atlas V, delivering the first booster just 42 months after the contract award, which underscores their team’s ability to design and deliver large solid rocket motors in support of the nation’s strategic goals and efforts to explore the solar system. The flight of the 100th AJ-60A, the largest monolithically wound solid rocket booster ever flown, took place recently as part of a complement of four that helped an Atlas V 541 place the nation’s newest weather satellite into GTO. Anywhere from one to five AJ-60As, each generating 348,500 pounds of thrust, can be used to augment the lift capability of the Atlas V, which has flown 76 missions to date in all of its configurations. AFSPC-11 is a multi-manifested mission. The forward spacecraft is referred to as CBAS (Continuous Broadcast Augmenting SATCOM) and the aft spacecraft is EAGLE (ESPA Augmented GEO Laboratory Experiment).